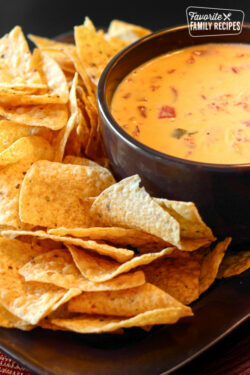 This Chili Cheese Dip is one of the easiest dips to make. It takes 5 minutes to prepare. Two words to describe this dish: easy and addicting. Perfect for parties and get togethers! 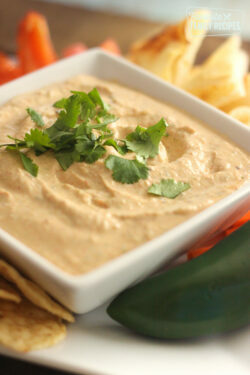 We make this dip all the time when we are watching our favorite sports on TV. It’s the perfect appetizer or snack. Sometimes I put the dip into a little slow cooker on low to keep it nice and warm while we are dipping our chips. It never lasts long though and always gets polished. 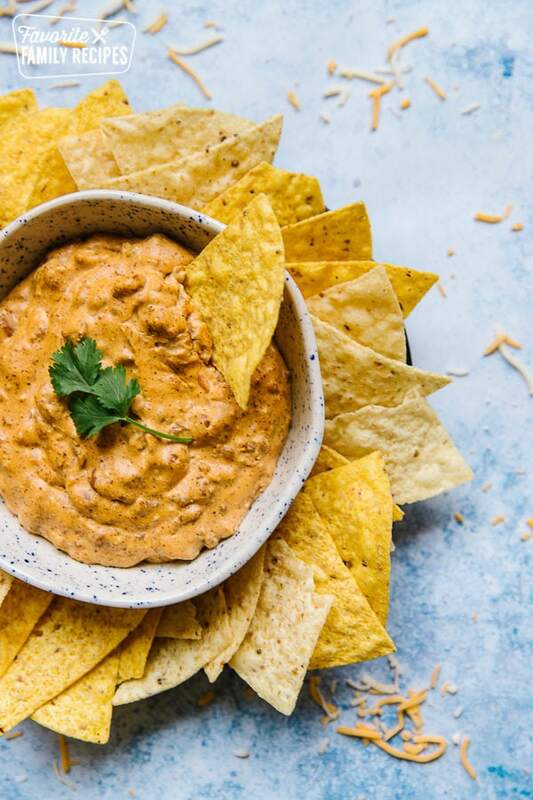 We especially like to eat this dip with Fritos. The combo of the chips with the chili cheese dip flavors is awesome! In a small saucepan, heat chili until warmed through. Add cream cheese and stir until it is completely melted into the chili. 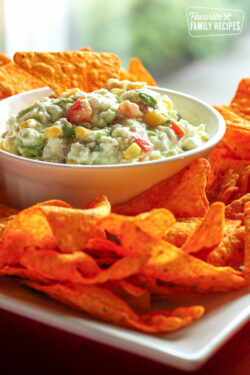 Serve with tortilla chips and/or Frito's corn chips. This recipe can easily be double or tripled for a crowd. 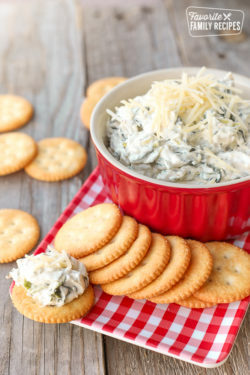 If serving at a party, keep the dip warm in a crock pot on low. Two fo my favroite things put together!!! Guess what I'm having for dinner?! Really? No cheddar in this recipe? I would have guessed that's what gave it the yellow color. I might have to give this a try since cheddar isn't that easy to find here, but canned chili and cream cheese are no problem. I make this too, but I use the Nalley's Walla-Walla onion chili. It's a favorite around here! I make this all of the time, but I add 1 cup of salsa. MMMM so good! Hi:) I'm new to your blog-but I will be returning often! I've scrolled through alot of your recipes-YUM! I make the same way as Cathy above and it is sooooo delicious. I am craving it right now. I would like this more if it wasn't as runny as mine turned out.. Maybe I used defective chili. I don't think I've ever commented before, but I've just gotta thank you for always posting the most yummy & do-able recipes! You've saved my life numerous times! This recipe in particular came in handy the other day when I had to come up with an appetizer last minute! Keep them coming! I make this also with a 1/2 cup cheddar in it and sprinkle lots of chopped cilantro on top. The cilantro makes it SO yummy! I’ve been making this for years except I also add a small jar of tostito’s salsa con queso…it gives it that yummy cheesy taste! I’ve never heard of dip this way, I’ve always used a 2lb. block of Velveeta with a can of hormel chili, no beans. Will try this!! What size package of cream cheese? I can’t believe no one asked. Must just be me who is missing it. Thanks. It is an 8 ounce package of cream cheese. I changed the amount in the recipe. Thank you for asking! This looks sooo good! What brand of chili do you use? Can you make this vegetarian by using a can of chili beans? or vegetarian chili? You can really use any kind of chili you like best! I would definitely get one that has more than jut chili beans. A vegetarian chili would be the way to go if you didn’t want the kind with meat.